Hi . . . How are you? Well . . . at least my 2018 Christmas look is. Three factors determined our holiday decor this year. Low energy & ambition . The last half of this year has been a circus of doctors, surgeons, hospitals and appointments, which has put energy levels, ambition and creativity on a constant roller coaster ride. Things are much improved but still not up to par. When Hubs began gathering the decoration bins, most sat unopened, as my mood quickly changed from excitement to exhaustion. A peek at the ornament boxes revealed the blue, white and silver pieces on top, so that became our 2018 color scheme. Holidays mean Hubs gladly allows me to do all of the decorating, especially the BIG tree. Below is a look from past years. The second obstacle this season is Della, our eight month puppy. While still cute . . . not so small anymore. She can only lay on top of that chair now. So no big tree this time! Not yet grown out of her puppy personality (destructiveness). The blues became official with a quick trip to a favorite thrift store, where ALL CHRISTMAS items happened to be 1/2 off. Some great pieces, and so many in blue hues. So at home, a blue Christmas it is, which works quite well with the new accent color we’re using in our open dining/kitchen area. A small tree instead of the tall. Little vignettes on the tables . . . Cabinet tops join in, with glass, trees, plates and tins. Two nativity sets are always a go . . .
. . . it’s modern in the bedroom . . .
and traditional on the piano. With this Christmas of blue, my hopes are that you will enjoy this colorful season, too. Have a wonderful holiday, stay safe and warm, and we’ll meet the new year together. Promptly on January 1st, the decor changes in our house. Ornaments are carefully removed, wrapped and safely stored away. The Christmas tree is dismantled and enters it’s box for another year of hibernation. All on New Year’s Day . . . but not this year. We’ve kept the holiday hanging on a while longer this time. More family coming on Saturday, so I just couldn’t change things out yet. Red and gold are primaries on the tree and . . .
a lot of red and white pop up too . . .
Our kitchen cabinet tops are one of my favorite decorating spots. and a few side arrangements. This creche of cute characters was a new addition this year, and these other funny little pieces too. Well, with only two more days to get ready for my company, I had better sign off. Before leaving, I want to share the beautiful gift I received from a special friend. Thanks Nadean, it’s perfect and I absolutely LOVE them. Just want you to know that Artzzle is “Still Hangin’ Around” too, and I hope to connect with you more often this year. Here’s wishing all of us a Wonderful New Year. For anyone, there are so many things to do and places to be, during the holidays. People have lots of contenders vying for their time. Those of us with “blended families” have extra scheduling difficulties in this season, as people have to multiply the visits and celebrations. It can be stressful, especially to kids, even after they’ve become adults. In the past two years, I’ve tried a different approach. We combine Thanksgiving and Christmas into one get-together, and we celebrate in mid-December or early January. The thought was to aim for less stress directly on the holidays, when so many other duties call. It has worked quite well … except … this year. So, for the first time – in a long time, even the single celebration has to be split, as schedules just can’t come together. This year, grandchildren are older, and teenagers have jobs and sports activities and everything included. So even if we’re not trying to use the exact holiday for our gathering, there are still conflicts. Solution: One family is coming here to our home, and we’re having a brunch instead of a turkey dinner w/fixings. I’m really looking forward to it, as the kids AND grandkids are doing all the cooking. Sounds like fun, don’t you think? Can’t wait! The other kids who are local, have been remodeling their home and wanted us to visit their place for a get-together. We headed over there last weekend, and had a blast. My daughter-in-law is a marvelous cook and this time, she even made a big vegan dish for my husband. And it was fun to see the new looks in their house. So, Readers … how will you be spending your time over the holidays? I love when you share in the comments. And if you’re looking for last minute decorating ideas, you can do a search in the menu bar up-top. Just type Christmas and you’ll find all of the projects and ideas I’ve posted previously, lots of stuff there. OR, visit Artzzle’s Facebook page. Lots more fun projects there and many are “kid” friendly too. be Happy, stay Safe and Best Wishes to all! Tomorrow is the 1st of December … already. Rain and record warm temperatures have dissolved the two light accumulations of snow we have had. Soggy, brown ground and cloudy days are on the schedule for the week. Many of you know but for those who don’t, I’ll tell you big messes really aren’t my thing! Can’t stand em’. They literally make me uncomfortable. But I do try to find something positive, even in a negative situation. The positive at this stage, was that seeing some of my Christmas treasures again, sparked an inkling of enthusiasm. By late Sunday evening, items were up here, but not arranged yet, and the kitchen and dining room were a complete disaster. Pieces, paper, boxes and bins everywhere. At that point, we were pooped out. And as awful as it is to wake up to a dirty house, it had to be … I was tired … so it was off to bed. Monday, creating some heavy duty enthusiasm was an ABSOLUTE MUST. I began browsing digital photo albums and finally … holiday posts from previous years. It opened a Pandora’s box of ideas. Click HERE for your inspiration. Meanwhile, Hubs and I will keep plugging away at our 2016 Holiday Home! This is only the beginning, but our goal is to finish by this coming Saturday. Next, current displays have to be taken down, wrapped and packed away. Lots of crawling, climbing, reaching and handing going on. Not a speedy process for a couple of old(ish) fogies decorators like us! TIP: No matter your age, always make climbing and ladder work a “two-person” project. In-home falls can be dangerous, but especially when working alone as you have no one to come to your aid. Besides … it’s always more fun and more work done … with two instead of one! There are ALWAYS A FEW OF US who need some décor perks FAST, especially during the extended holiday seasons. So, keeping with my 1-2-3, EZ PZ philosophies about such things . . . here ya go! Be sure to catch all the TIPS and the LIST of supplies. OR you can simply use the inside message section of your card (the back half). NOW punch holes in the top corners of each piece. USE twine, yarn, ribbon or whatever you want, to string the cards and form your banner. 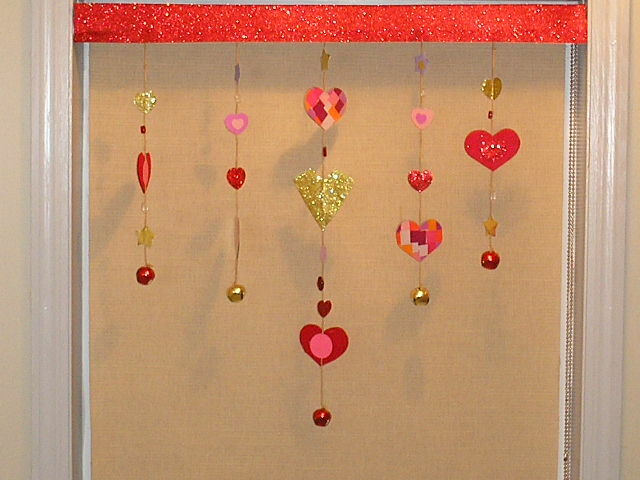 It is light weight and can be hung with thumb tacks or push pins, without damaging walls. TIPS: Re: After Christmas sales: 1. Look for designs that instantly catch your eye. For banners and many other projects, you’ll want variety so choose cards that have several designs in the box. These screamed my name right away. The design is big, colorful and generic themed AND the images are glittered = sparkle and interest. 2. Look for cards with COLORED ENVELOPES. That’s just more colored paper for any crafts! 3. Faux Flowers: Bushes of flowers rather than single stems, give you more bang for your buck. Just snip off individual blooms to scatter through the house. 4. Wrapping paper: I always buy the widest, longest rolls … not the short, skimpy ones. I look for paper in colors that can be used ALL YEAR ROUND not just seasonally. I buy as many coordinated patterns and colors as I can afford. Paper doesn’t spoil, right! 5. DON’T MISS your local thrift store sales, both before and after Christmas. TON’S of deals there and you’re supporting your community, too! 6. Always start with my golden rule . . . house shop first, use what you already have before buying more! a basket, a bowl, any glass jar or vase available. EZ PZ with things you already have. Below, the ornaments are in a beautiful, giant copper leaf piece, a gift from one of my daughters. The little “Russian Doll” snowmen another daughter and I saw years ago while shopping at Sears. They were on the check-out counter and I said how cute they were. So the clerk said “Here, you can have these!” A memory moment for sure. YES … you know it. Even my bathroom gets decorated. BLING belongs everywhere. . . you knew that, right! Pointsettias are everywhere. Buy one or two for important spots in your room. Pine branches are easy to come by and so are fake pine garlands. A small grouping of pine, a faux flower and a Holiday item are an instant little vignette. Put one of your houseplants in a bright basket. Wrap some empty boxes in varied sizes and papers. Only takes a few minutes. OR you could wrap small items you’re giving as guest favors and throw them in a big basket. NO TREE . . . take a bamboo basket or tub, and put all your gift-wrapped presents in them. Lots of bang with what you have already. This is one of the most easy and fun ideas. No pictures but just use your imagination. Make one big bow for a centerpiece. Make several small bows to scatter here, there and everywhere. Make a quick tree garland or wall banner with thick ribbon and a few unbreakable ornaments. Wrap jars with pretty ribbon and use as serving pieces … hold candy, silverware, extra napkins, etc. HAVE FUN. ?? Candy ?? YES, that’s what it says. Hey talk about multiple duties: decor, gifts, food AND inexpensive. C’mon people, candy is perfect! Stores have tons of beautiful foil wrapped chocolates and candies for the holidays. USE em! OR Candy canes are cheap, pretty and edible. Hang them on the tree, put em’ in a jar (with a ribbon tied round it). The next shot includes Paper, Fabric, Pine Branches and Ornaments, used in pieces I already owned. AND this arrangement carried me during Fall through New Years that year! Already owned vases, jars, holders, etc. FINALLY . . . I know, this has been a long one, yikes. But here’s the EASIEST. Take down some of your wall art pictures; wrap them with pretty paper and ribbon, then hang em’ back up. There you go … instant Christmas decor. CLICK THIS TO FIND MORE EASY IDEAS. Hope these have been positive inspirations to help you eliminate those last minute stresses. We’ll talk again soon. UNTIL NEXT TIME EVERYONE … stress less – accomplish more! Christmas Past is today’s post … a fun one from 2015. Enjoy. A favorite online place of mine is the Farrow and Ball site. You’ll never fail to find something beautiful to enjoy; color and decor ideas, crafts and more. Today I’m sharing this Christmas post … have fun! it’s time to think about Christmas. We usually ease into Christmas gradually, but this year since our family is combining the two holidays, and celebrating in Mid-December, I began early, pre-Thanksgiving, even. The most difficult and time consuming part (and a great relief when completed) is the tree, so it goes up first. Then after a few nights of pretty lights, I’m in the spirit to do the rest. Often, I work with a definite color scheme and theme, continuing it through the house. Not so much this time. I brought out all of our “special” family ornaments and memory pieces, added a bit of sparkle with some beads and garland, and finally, added multi-colored ornaments through-out. The result is a very old-fashioned, homey look, especially since we placed the tree right by the fireplace. I have a collection of Dayton Hudson Corporation “SANTA BEARS”; small in quantity (only 3) because the guys themselves are big and a bit difficult to hibernate for the rest of the year. In 2014, it was just Hubs and I around, so no giganto tree. I put all three bears atop the piano, around a small table tree. This year, the bears are taking up individual little spots in the living room. At a younger age or earlier stage, your holiday decor collection will just be starting. Don’t feel you have to rush right out and grab everything on your first official holiday. One of my favorite tips applies at Christmas too. TIP #1: Start with what you already have, and build from there. EXAMPLE: A plate and figurine, a metallic (musical tree) and bright colored books with metallic print. You may already have a piece or two that you treasure. Pull some ideas and color from that. Cost on pieces: Plate = $2.00; Santa Bell = $0.75; Tree = $1.50 (silver plated, musical) . All are thrift buys, but keep in mind, all purchased at different times. If you’re a complete beginner, shop for two or three items you really like, then try a boost with a little greenery, faux or real. Also in this season, take advantage of the beautiful wrapping papers and fabrics. No sew … just fluff up a remnant fabric, tuck under the rough edges and top it off with some pretties. Above, I just wrapped three sizes of boxes, held together with ribbon and topped with a bow. I put one of my houseplants in a bright red basket (thrift store $0.25) for a holiday look. USE YOUR IMAGINATION … and HAVE FUN! TIP #2: This is a great time of year to shop all of your local thrift stores. There are beautiful pieces for just pennies. Good for the budget (and not as crowded as the big box stores). The stars below were $3.00 and $0.75. I get most of my books at a local Goodwill in their end-of-day sales. Last time I purchased 10 beautiful HARDBACK books for $2.00. That’s $0.20 each, guys). I never pay more than a dollar for any book unless it’s stupendous! TIP #3: Remember the Magic # 3. Those arrangements and little vignettes are as easy as 1-2-3. Start with three items varied in height and interest. Work with the 3 essentials; color, pattern and textures. Be sure to “ground” your grouping; use a pretty fabric, or perhaps a seasonal placemat; maybe a book or two. If your objects are just sitting in the middle of a table, they give a disconnected look; just floating around. That’s why it’s important to ground. Our place isn’t finished for the coming celebrations, but here are some 14 vs. 15 looks at the kitchen cab tops. Finally, a 2014 shot of one of the hutch shelves. I’m using this one again. Okay … I’m “holiday’ed” out for this time. Enjoy the rest of your weekend and remember … staying positive is a good way to stay productive. It’s reality time around here today. Well … yesterday, today and a few more days following. If I am brave enough to post the pictures, this article will prove once and for all, that indeed, I don’t always have a spotless house! Yes, this post involves one ugly mess AND toilet paper . . . but don’t worry, one has no relation to the other (at least not today). True, we’re barely at the brink of the Thanksgiving holidays, and still far away from Christmas or Hanukkah, but I have a great reason for considering them all, at this very moment. Our tribe is located far and wide, with many blended family members and obligated gatherings they must attend. It makes holiday plans difficult for everyone to schedule. And of course, our Midwest weather often compounds the problems. The photo above is from a previous year. Right now, our weather is great … but I put emphasis on the RIGHT NOW part! We always tell the kids that our celebrations don’t have to be on the exact day or holiday weekend. It has become a successful plan, as everyone is less harried and more relaxed when they don’t have to “eat and run”. For a change, this year instead of two distinct celebrations, our house is having one big shindig … on December 13th. A date between the two major events, and as thus, there’ll be no specific turkey or menu item, just a giant potluck. My attitude is sort of “eat what’s here or fill up when you get home”. I figure if everyone brings things they enjoy eating, it should be just fine. Right?! I say “bring on the baked goods”! But back to point. My big mess is the holiday ornaments, trappings and wrappings strewn everywhere. Hub’s dragged up the Christmas tubs from the crawl space, and got the tree down from the garage attic. And here it all sits, not beautifully arranged as yet, but simply opened and stacked throughout the rooms. My master plan began with an early evaluation of ALL of the pieces. It’s part of my “get rid of it, clutter-free” campaign. Facing facts, we don’t need even half of this conglomeration. I won’t say exactly half will leave, but I’m really trying for that result. First, I sorted and threw out any broken or damaged pieces. Next, I chose several items or groups of ornaments and listed them on Craigslist. The idea being whatever doesn’t sell, will be donated to the little thrift store where I volunteer. As this will happen before December 13th, they’ll still have plenty of time for Christmas sales. And, actually, we make quite a bit on our “After Holidays” sales too. There were literally hundreds of unbreakable ornaments, all shapes, colors and sizes.I DID keep a few of each type, but the majority was divided evenly. Two sets of 150 ornaments each, with mixed colors and designs, will go to Craigslist or the store. Amongst the Christmas things, I found a few Fall and Thanksgiving items as well. Those also went on Craigslist. The tree is up and skirted, but stands naked by the fireplace at the moment. And yes, in the shot above, that is Gracie’s rear end in the upper right area. My SANTA BEARS came out of hibernation. They will all be STAYING. Right now one of them is atop the piano. The new shelf unit Hubs made me this summer, previously held my vase collection. Now, it’s showing off my mini Christmas tree collection. You can see I’ve done a good editing job with this group. Below are the items for Craigslist. That’s where we’re at today. And this mess should prove to you doubters that my house isn’t always picture perfect. But don’t count on many more examples of it, because I was REALLY HESITANT to feature these! So, that’s the UGLY MESS … but you’re still wondering about the Toilet Paper, right? Well, another Cher, my friend over at Craft Alternatives, sent this out last week, and I just had to share it. C’mon, pretty, right? And YES, it is too “Toilet Paper” in there 🙂 Be sure not to miss the optional container ideas! Thanks, Cher. We’ll talk again soon. And remember, positive equals productive, and staying so, helps you feel happier, for all those special days coming up. FOLLOW ARTZZLE and ALWAYS know what's up! Enter your email address to follow this blog and receive notifications of new posts by email. You'll receive a follow-up email to confirm your registration. Thank you. Visit Artzzle's profile on Pinterest. Wow, That New Color Is Just . . .
Is It Time . . . to Color Things Up? All articles are original to Artzzle.com, and appear first here, unless noted. No included content or photography can be used elsewhere without specific permission and accreditation. Outside sources are marked when available.